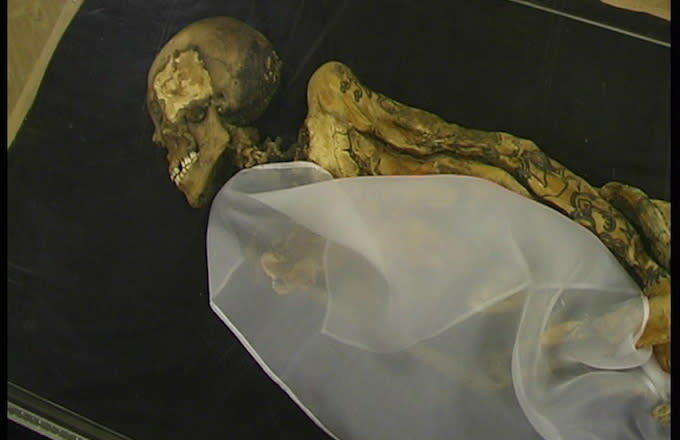 Back in 1993, researchers in Siberia discovered a mummy with tattoos that was believed to have died 2,500 years ago. The woman was around 25 years old when she died. She was dubbed the "Ukok princess" because of the elaborate clothing that she was buried in, and the number and kinds of tattoos that she had. "Tattoos were used as a mean of personal identification - like a passport now," said Novosibirsk scientist Natalia Polosmak, who added that the princess&apos;s mythical and real animal tattoos signified her age and status. The wonders of science have discovered that Ukok princess may have also smoked marijuana, but not recreationally. MRI scans revealed that she likely had breast cancer which left her in an emaciated state. Dr Letyagin analyzed the scans and concluded that the princess also had "traces of traumas she got not so long before her death, serious traumas - dislocations of joints, fractures of the skull. These injuries look like she got them falling from a height." Dr. Polosmak said that the container of cannabis that was found with the princess was probably for her injuries. "For this sick woman, sniffing cannabis was a forced necessity...We can suggest that through her could speak the ancestral spirits and gods. Her ecstatic visions in all likelihood allowed her to be considered as some chosen being, necessary and crucial for the benefit of society. She can be seen as the darling of spirits and cherished until her last breath." This story should definitely be featured in the next "Legalize It" commercial.